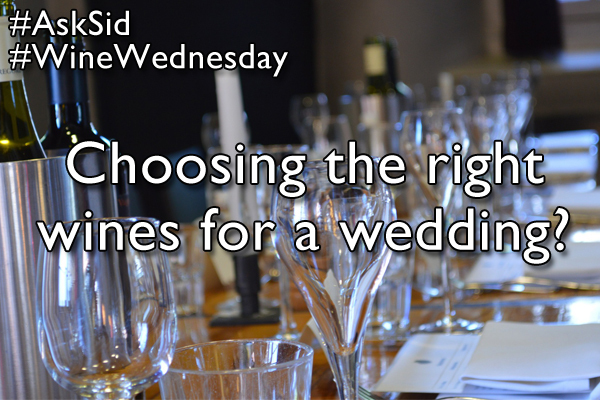 Ask Sid: Choosing the right wines for a wedding? Question: I am hosting a wedding that is serving steak and fish. What wine recommendations would you make based on a modest budget of under $40 per bottle? Answer: Your total number attending is an important missing fact. If a small intimate dinner of 8-12 serve a variety of wines as one bottle of each wine will work nicely. However I am assuming it must be an larger event with many friends. Not sure if you are serving one combined course of “surf & turf” or an alternate main of steak or fish. Regardless keep it simple but try to give everyone a choice of one red or one white. This will make the serving and especially re-pours much easier for the staff. Don’t neglect the idea of sparkling throughout – say a white or a rose. After all it is a festive occasion that suits Champagne but on your limited budget there still are lots of other excellent bubbles available for you to use. Most wedding receptions have fierce mark-ups so $40 though suitable at retail might not get you much quality at your special wedding location. Possibly Cava with the always reliable Segura Viudas and the new fresh dry Freixenet Cordon Rosado. Latest vintage Sauvignon Blanc or Chardonnay for the fish from the Casablanca or Leyda regions of Chile are good value around $15. Admire what Cono Sur does with all their wines – including my fav of 20 Barrels Pinot Noir around $25. Another idea would be a Viognier from Languedoc – maybe Three Winds 2012/2013. Malbec from Argentina is much improved and popular in such an easy approachable style for a young red – lots of choice but dependable Norton Barrel Select 2010/2011 is intense and peppery. The key is to try and choose food wines that are fresh and acceptable to the majority of your guests.